The new GCC BDI Director Development Programme provides a structured road map for professional director development tailored for GCC directors. The designation is awarded to individuals who have successfully completed the relevant training programme and a multiple choice questions based assessment. The training programme is based on GCC BDI’s Board Director Competency Framework. The World of Directorship – Certificate in Board Directorship is being launched in April 2019. The other qualification levels will follow in 2020. And an optional assessment for those participants pursuing a Certificate Award that contains a multiple-choice examination. Participants can attend 1, 2, 3 or all 4 modules, but to be certified, they must attend all 4 modules and pass the final test. This module of “The World of Directorship – Certificate in Board Directorship” explores the roles played by the shareowners, boards, directors, executive managers and other stakeholders. This module of “The World of Directorship – Certificate in Board Directorship” examines the role, authority and legal responsibilities of an effective director. This module of “The World of Directorship – Certificate in Board Directorship” explores the role of the board in formulating and implementing strategy and managing enterprise risk. The course includes the evaluation of the executive directors’ performance as well as business ethics. This module of “The World of Directorship – Certificate in Board Directorship” explores the financial stewardship and accountability obligations of the board to shareholders and other key stakeholders. The World of Directorship - Certificate in Board Directorship is a programme designed to meet the development needs of existing, new and aspiring members of boards of directors and board committees. The programme is also designed to meet the development needs of advisors and senior managers who report to the board or board committees who are interested in expanding their knowledge of corporate governance. In addition, professional executives with an interest in corporate governance may find the course to be relevant and useful e.g. media, judiciary, legal, accounting, finance and banking. Participants should book their seats online via the website or email getinvolved@gccbdi.org. Participants with MBAs and or other professional qualifications will be required to attend all modules. No exemptions will be awarded. All prices exclude VAT or any other applicable taxes. Pre-payment is required for all participants. 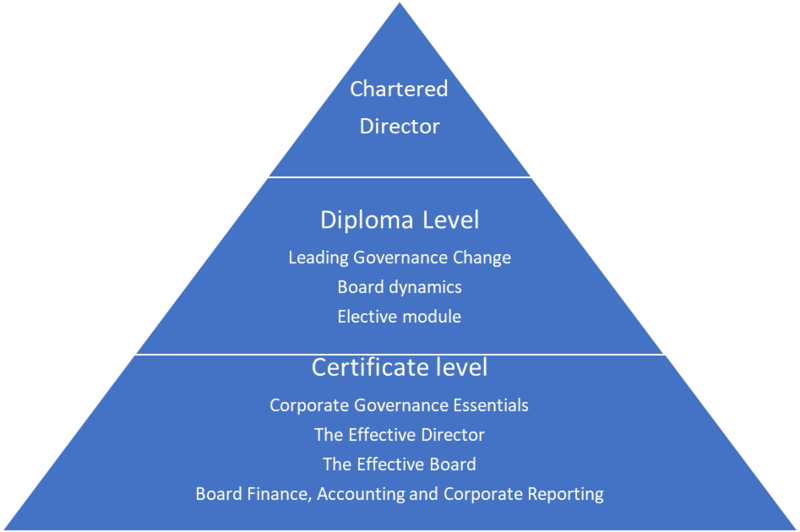 Achieving the award of a Certificate in Board Directorship means that a director has demonstrated an internationally accepted level of understanding of corporate governance, the role of the board and the director, strategy, risk, ethics, accounting, finance, control and corporate reporting. A director that has attained the award of a Certificate in Board Directorship is equipped to make a valuable contribution to any board based upon increased knowledge and confidence. It offers a clear course structure and development path leading ultimately to Chartered Director. It validates that an individual has the core knowledge and awareness that is necessary to function effectively as a director. The regulators are increasingly requiring board directors to demonstrate they have undertaken professional development. Through attaining the designation, you signal to the market place that you are ready to serve as a director. Companies appointing directors on to subsidiary or joint venture boards are increasingly recognising the value that board directors can provide to their organisations and want to ensure their appointees have the right knowledge and skills. Certification enables directors to demonstrate their commitment to professional development and to benchmark their own knowledge and skills against clearly established standards of good governance practice. Being a Certified Director provides you with the confidence as an aspirant or a less experienced director, as well as providing the market place with assurance of your ability and competence. The professional designation raises your profile as an aspirant or less experienced director and sets you apart amongst your peers. We will publish the list of Certified Directors on our website. You are entitled to use the designation Cert.Dir. (GCCBDI) after your name. Provides GCC-relevant content and details of local regulations and incorporates regional aspects in course content as well as using global case studies. GCC BDI is a not for profit company whose mission is to make a positive impact on the economies and societies of the region by promoting professional directorship and raising the level of board effectiveness. We have a long and successful and proven track record of delivering top quality programmes and working with the top companies in the GCC over the last 11 years. We work with a large talented pool of top international, regional and local experts in their field, mainly practioners. Our expertise extends well beyond pure academic references and is based on tried and tested methodologies and programmes. GCC BDI now works with over 1200 GCC alumni members, the largest and most influential network of directors in the region. Our members are our greatest ambassadors. We believe that director development is critical to board effectiveness. GCC BDI’s unique combination of skills and experience, local knowledge and understanding, and strong corporate governance and regulatory knowledge, combined with practical director expertise is what enables us to deliver exceptionally high quality programmes.